Wouldn’t it be great if, in that heart-in-mouth grip-clip moment, you knew that at least the quickdraw was on your side? The Alpha Clip is considered DMM's most ‘clip friendly’ biner ever. The bent gate, with its flared-out barrel shape works in perfect harmony with the kinked and groove-patterned back bar. It just feels so right, handles so well, and most importantly the rope always goes in first time. On the other end of the draw, you'll find the Alpha Pro. Bolt hangers can be very unforgiving of lightweight biners, particularly if you are dogging about and taking repeated redpoint falls so, like the Clip, the Alpha Pro is robust and strong enough to cope with the typical sport climbing scenarios and, again like the Clip, what really makes it stand out from the crowd is its exceptional handling qualities. 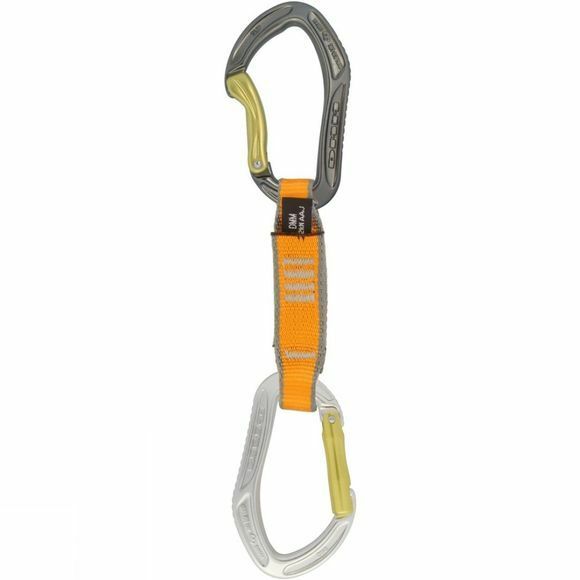 A sport quickdraw can get a lot of abuse, particularly on redpoints where repeated falls are taken; with this in mind the Alpha Sport is equipped with a robust sling section to suit the situation. The 26mm variable width nylon gives the perfect set up. It is easy to grab if you are bolt-to-bolting your way up to the belay during a redpoint practice session. The sling also tapers down to a neat 16mm ensuring it sits securely in the crook of the biner and always loads correctly. There is even a rubber loop running on the inside of the tape on the Alpha Pro biner, which adds yet more stability.